I thought I’d give the whole WIP Wednesday thing a go. I’m not entirely sure where it originated, but it sounds cute. And if I don’t do a WIP post, no one will be seeing the socks that I’m working on for a long, long time! 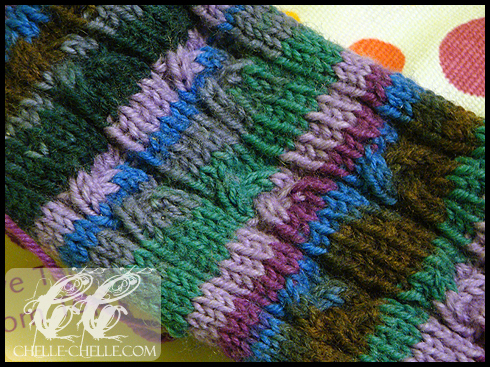 I am currently working on the Knot Socks by Nancy Bush on 2.25mm/US1 circulars with Regia Design Line Kaffe Fassett in colour #04453 which is self-striping/self-patterning yarn. 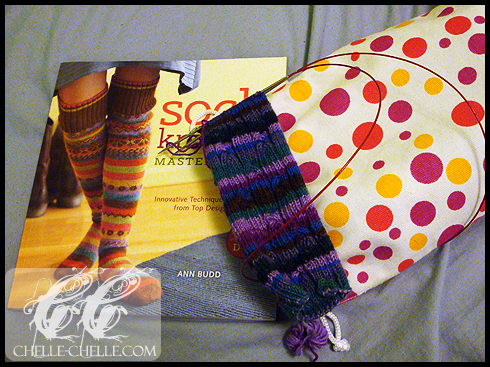 The pattern is from Sock Knitting Master Class: Innovative Techniques & Patterns. So far it’s knitting up fantastically, I’ve finished cable pattern 4 times and need to do it just once more before I go onto the heel. It’s a cuff-down pattern and written for dpns. I’m knitting it on my new ChiagoGoo Red Lace circulars (2.25mm/US 1 – 40″) with the magic loop method (which I adore now that I have needles with great cables). I haven’t decided how I’m going to do the heel yet, I haven’t figured out how to do the heel flap and gusset with magic loop so I may end up doing an afterthought heel. Each pattern repeat takes about 2.5-3 hours, so I estimate that I’ve spent around 11-13.5 hours on Sock #1 so far. I knit whenever I’m watching podcasts. I currently have no other knitting projects on the needles – I’m waiting for a Blythe friend to choose yarn colours and then I’ll be knitting two cardigans with pockets for her in exchange for a very lovely dress. For crochet projects, it’s currently a secret… I’m designing an amigurumi so it’ll be secret for a bit until I finish it and duplicate it with the notes that I’ve got. I’ve been slowly working on getting the pattern shop for Chelle-Chelle.com up and running and have been tweaking with coding for the last little bit – but I hope it get it open at the same time that the pattern is finished. Upcoming miscellaneous things: I’ll be doing a review on the ChiaoGoo Red Lace needles (I feel that 10+ hours is a decent amount of time to try something out before reviewing it) and also a post soon about all the podcasts that I listen to regularly.